Kien Giang (VNA) – Vietnam always creates optimal conditions for investors in the country, especially in tourism, vowed Prime Minister Nguyen Xuan Phuc at a meeting with executives of Sun Group, one of the major investors with large tourism projects in Phu Quoc island in the Mekong Delta province of Kien Giang on April 13. The PM lauded the firm’s investments in many huge projects across Vietnam, including the world’s longest suspension cable to Fansipan Mountain in northern Lao Cai province, saying these have created jobs and contributed to socio-economic growth of many localities as well as the development of Vietnam’s tourism trademark. Sun Group has run tourism and resort projects in Lao Cai, Phu Quoc, Da Nang and Quang Nam. The group’s tourism and resort projects in Phu Quoc include JW Marriott Phu Quoc Emerald Bay, Premier Village Phu Quoc Resort and Premier Residences Phu Quoc Emerald Bay. Highlighting the Party and State’s policy to turn tourism into a spearhead economic sector, PM Phuc suggested that the firm and other investors should work to introduce unique and impressive tourism products that are supported by locals. 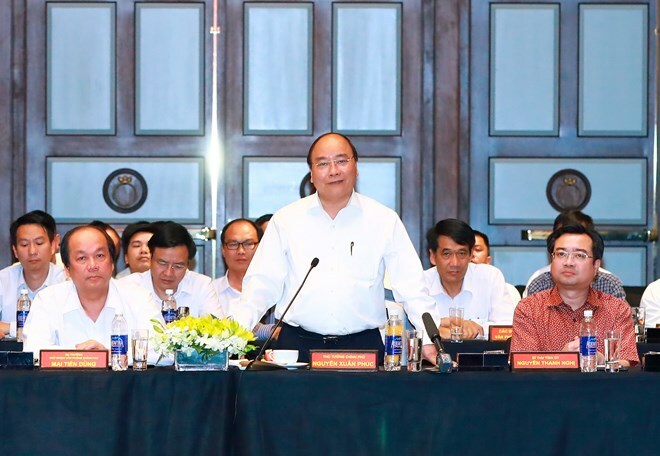 He also praised the authorities of Phu Quoc island district and Kien Giang province for adopting mechanisms to attract giant firms to invest in tourism infrastructure in Phu Quoc, regarding the move as a valuable experience in tourism development for localities. He noted that Vietnam enjoyed a growth of 20 percent in the number of tourists in 2016 and 30 percent in the first quarter of this year. In the first quarter of 2017, Phu Quoc island welcomed about 553,500 visitors, a surge of 82.7 percent year on year, including 139,000 foreigners, up 53 percent over the same time in 2016. The same day, Prime Minister Nguyen Xuan Phuc also laid flowers at the Phu Quoc Martyrs’ Cemetery, which is the resting place of over 3,500 martyrs who laid down their lives in the island.